Soon after receiving the anointing of the Holy Spirit, Finney had a lengthy conversation with his pastor, Mr. Gale, concerning the advisability of preparing for the ministry. Mr. Gale was a graduate of Princeton University, but was a firm believer in the Old School Calvinistic doctrines, which to Finney’s mind seemed very absurd and contradictory. Mr. Gale and he could scarcely agree on any point of doctrine. Mr. Gale believed in the doctrine of a limited atonement, or that Christ died only for the elect, while Finney believed that He died for all. Mr. Gale held that men were so depraved by nature that they had no free agency, while Finney believed that all men had the power to accept or reject salvation. Mr. Gale believed that Christ paid the exact penalty of the sinner, while Finney believed that He did not bear the exact penalty but that He bore sufficient [suffering] to enable God to forgive sin without mankind thinking that He was allowing sin to go unpunished. Notwithstanding their differences Finney, in 1822, placed himself under the care of the Presbytery as a candidate for the ministry. Some of the ministers urged him to go to Princeton, but he declined. They then appointed Mr. Gale to superintend his studies. His studies, so far as Mr. Gale was concerned, were only a series of controversies, but he made good use of Mr. Gale’s library. He felt that he would rather not preach than teach the doctrines held by Mr. Gale, but a good elder in the church who held similar views to Finney gave him much encouragement, and prayed with him frequently. During the few months that Finney studied under Mr. Gale a Universalist minister came to Adams and greatly disturbed the faith of many. Finney replied to his arguments and completely overthrew them. The Presbytery was finally called together at Adams, in 1824, and licensed Finney to preach. The two written sermons he prepared for them were, with two exceptions, the only written sermons he ever prepared. He tried one other time to preach from a written sermon, but believed that it hindered the Spirit of God from speaking through him. Finney’s first regular meetings were held at Evans Mills, Oneida County, New York. The people praised his sermons, but for two or three weeks no one decided for Christ. Then Finney urged all who were willing to accept Christ to rise to their feet and all who were willing to reject him to remain on their seats. This was very unusual in those days, and made the people so angry that they were almost ready to mob Finney. Next day he spent the day in fasting and prayer, and in the evening preached with such unction and power that a great conviction of sin swept over the people. All night long they were sending for him to come and pray with them. Even hardened atheists were brought to Christ. He continued to preach the gospel, with increasing power and results, visiting many of the leading cities of America and Great Britain. Sometimes the power of God was so manifest in his meetings that almost the entire audience fell on their knees in prayer or were prostrated on the floor. When in the pulpit he sometimes felt almost lifted off his feet by the power of the Spirit of God. Some persons believe that the moral work of the Holy Spirit is not accompanied by any physical manifestations; but both in Bible times and in Finney’s meetings remarkable physical manifestations seemed to accompany the moral work of the Holy Spirit when the moral work was deep and powerful. At times, when Finney was speaking, the power of the Spirit seemed to descend like a cloud of glory upon him. Often a hallowed calm, noticeable even to the unsaved, seemed to settle down upon cities where he was holding meetings. Sinners were often brought under conviction of sin almost as soon as they entered these cities. Finney seemed so anointed with the Holy Spirit that people were often brought under conviction of sin just by looking at him. When holding meetings at Utica, New York, he visited a large factory there and was looking at the machinery. At the sight of him one of the operatives, and then another, and then another broke down and wept under a sense of their sins, and finally so many were sobbing and weeping that the machinery had to be stopped while Finney pointed them to Christ. At a country place named Sodom, in the state of New York, Finney gave one address in which he described the condition of Sodom before God destroyed it. “I had not spoken in this strain more than a quarter of an hour,” says he, “when an awful solemnity seemed to settle upon them; the congregation began to fall from their seats in every direction, and cried for mercy. If I had had a sword in each hand, I could not have cut them down as fast as they fell. Nearly the whole congregation were either on their knees or prostrate, I should think, in less than two minutes from the first shock that fell upon them. Every one prayed who was able to speak at all.” Similar scenes were witnessed in many other places. 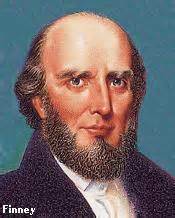 In London, England, between 1,500 and 2,000 persons were seeking salvation in one day in Finney’s meetings. Enormous numbers inquired the way of salvation in his meetings in New York, Boston, Rochester, and many other important cities of America. The great revival of 1858-1859, one of the greatest revivals in the world’s history, was the direct result of his meetings. “That was the greatest work of God, and the greatest revival of religion the world has ever seen,” says Dr. Lyman Beecher. It is estimated that six hundred thousand persons were brought to Christ in this revival. In 1833 Finney became a Congregationalist, and later a President of Oberlin College, Ohio. The great object in founding this college was to train students for the ministry. The remainder of Finney’s time was divided between his work at Oberlin and holding meetings in different parts of the country. Finney’s writings have had an enormous circulation and have greatly influenced the religious life of the world. This is especially true of his “Autobiography,” his “Lectures on Revivals,” “Lectures to Professing Christians,” and his “Systematic Theology.” These books have all had a worldwide circulation. Here are some additional audio and text resourses for Charles G. Finney . Click on any link below .